Staff photo by Tim Barber U.S. Sen. Bob Corker, R-Tenn., speaks to the Rotary Club of Chattanooga Thursday at the Chattanooga Convention Center. 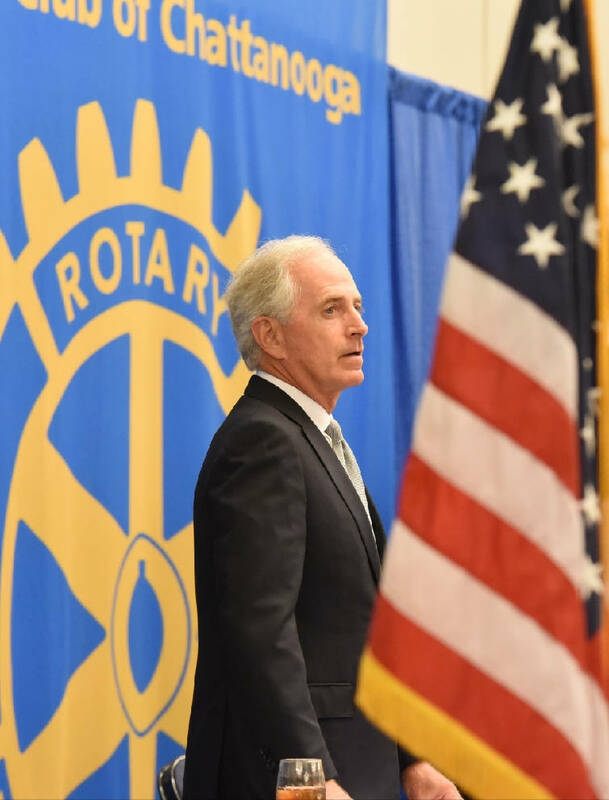 When U.S. Sen. Bob Corker comes to his hometown and tells the Rotary Club that President Donald Trump has not demonstrated the stability or competence to be a successful president, it's a jaw-dropper. And when Corker tells Rotarians that the nation will be in peril unless there are "radical changes " at the White House, it's a sure bet things are horrifyingly chaotic in Washington. Corker, a former mayor of Chattanooga, 10-year veteran of the Senate and chairman of the Senate Foreign Relations Committee, isn't prone to criticizing fellow congress members of either party — let alone the Republican President of the United States. So when Corker resolutely cut the knees from beneath the Trump presidency using words like "stability" and "competence" and "peril" almost in the same breath and in a roomful of Chattanooga's top professionals and business leaders, the earth moved. Talking to a gaggle of reporters afterward, Corker said all that a second time — on camera and on tape. The statements went viral in no time — from cable news stations to The New York Times and Washington Post. CNN's Chris Cillizza wrote: "Bob Corker just went there on Trump's 'competence.' Words matter in politics. Corker is clearly hinting at the possibility that Trump is not simply misguided in some of his policies and pronouncements — but that he may be fundamentally unfit for the office that he currently holds." Corker, who for a time was on Trump's short list as both a vice presidential contender and a secretary of state contender, acknowledged that he hopes his words will prod the president to be a better leader. Corker also is weighing whether to seek re-election to the U.S. Senate next year or perhaps make a bid to become Tennessee's next governor. National pundits have posited that if the GOP decides to primary Trump in 2020, perhaps Corker would make a good contender. Meanwhile, Corker had some GOP company in his criticism of Trump. South Carolina's Tim Scott, the only black Republican in the Senate, said this week that Trump lost all moral authority with his Tuesday pronouncements that both the "alt-left" and white supremacists were to blame for violence in Charlottesville, Va. A man described as a Nazi sympathizer rammed his car into a crowd of counter-protesters, killing a woman and injuring 19 others. Two law enforcement officers were killed when their patrol helicopter crashed as they surveyed the protests. "I'm not going to defend the indefensible," Scott said. "His [Trump's] comments on Monday [denouncing racism and white supremacists] were strong. His comments on Tuesday [assigning guilt to the counter-protesters, too] started erasing the comments that were strong. What we want to see from our president is clarity and moral authority. And that moral authority is compromised when Tuesday happens." So the dam is finally breaking. Now there are more Republicans joining Sens. John McCain, Lindsay Graham and Jeff Flake in questioning seven months of erratic words and actions from the president. Those senators' statements — especially Corker's — amplify statements from the nation's five top military commanders condemning hatred, extremism and racism as the president doubled down and said some "fine people" were among the neo-Nazis and white nationalists in Charlottesville. Those statements also stand tall alongside the resignations of corporate CEOs from three of Trump's showy advisory boards. In Chattanooga on Thursday Corker wouldn't talk about whether "radical changes" needed at the White House meant that he thought embattled presidential adviser Steve Bannon should be fired. Bannon, who has denied he is a white supremacist but proudly called his Breitbart News the "platform for the alt-right," was fired Friday (though he reportedly told national reporters that he had resigned two weeks earlier). White House Press Secretary Sarah Sanders said in a statement: "White House Chief of Staff John Kelly and Steve Bannon have mutually agreed today would be Steve's last day. We are grateful for his service and wish him the best." But firing Bannon won't be enough. The problem hasn't been Bannon. If the man at the top was stable and competent, Bannon would never have been there in the first place. Thank you for speaking out, Sen. Corker. Stick to your guns.